Blender 3D’s PBR shader implementation may have arrived in the form of the Principled BSDF Shader. This is a Cycles Render shader node. Below video is a short demonstration of the Principled BSDF Shader in action. Basically, the video shows the Base / Metallic / Roughness workflow that is combined with a Normal map. The Base colour map is used to determine the base colours of the surface. The Metallic map is used to determine which regions are made of metal and which are non-metallic. The Roughness map is used to determine the degree of roughness on the regions of the surface. The Normal Map is used to provide the bumpiness on the surface. As you can see, compared to the older way of material and shader creation, this is simpler. It can be used to make different kinds of material as varied as metal, plastic, glass, etc. However, in order to use it effectively, an understanding of the PBR workflow is needed. PBR stands for Physically Based Rendering. It is a new generation of shading method that is currently popular with game engines such as Unity and Unreal Engine. Studiorola provides training and consultation pertaining to open source modelling and visualisation solutions. 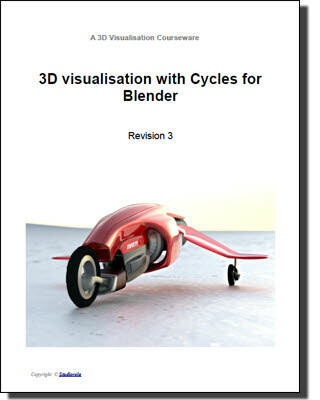 Click link for details on >> Blender 3D Related Training . Cycles is an increasingly popular rendering engine. It can be used either with CPU or GPU for calculation of renders. Coupled with a dedicated graphics card, rendering speeds can be greatly improved. Besides being used in Blender, it is also being used by other 3D programs such as Rhinoceros and Cinema 4D.